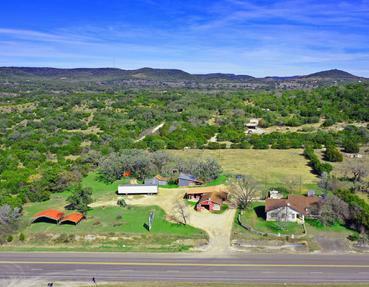 Excellent combination residential/commercial acreage located along the State Highway 16 corridor between Pipe Creek and Bandera, Texas. The main home offers over 2,700 square feet of living space in a remodeled/expanded two-story home and offers four (4) full bedrooms and two (2) full baths. Coupled with the home is a large retail/warehouse building with dock-high loading as well as grade-level area currently serving as a feed store, which has been in operation for nearly 40-years. In addition, the property offers numerous outbuildings and enclosed covered barn/storage areas. The rear portion of the land is level and open and could be used to expand on a new business opportunity or held as managable lands for agricultural projects. The property includes a smaller guest house as well. The City of Pipe Creek has long been a bedroom community of San Antonio that enjoys excellent traffic flow as well as providing for year-round activities through the highly visited Cowboy Capital of the World (Bandera, Texas). The subject property is centrally located along the primary traffic arterial and enjoys a major traffic count component and excellent visibility. The subject improvements are uniquely aligned to provide for high visibility, excellent continuous traffic flow as well as some nice mature trees to enhance the overall development appeal of the property. This 1/2-Acre Tract is located next to E-Z Mart, along the South Line of State Highway 16, South within the unicorporated area of Pipe Creek, Texas. An excellent piece of Prime Un-Zoned property with concrete threshold for Ingress/Egress to/from S.H. 16 already in-place for a new retail/residential property. Property is located in the growing northwest corridor, which is experiencing rapid expansion. This is an excellent opportunity for retail/office, owner-occupied, professional practice, restaurant, etc. Hwy 16 South between Helotes and Bandera and more particularly located next to E-Z Mart Convenience Store.